Viking - 4: In the Highlands & Islands - Norse Takeover Bid for Mainland Scotland From Caithness and Sutherland? "Unwise is he who lies awake all night, worrying. When morning comes he is restless yet, his burden not lightened". Four ethnic groups claimed territory in a land later named 'Scotland' by the ultimate winners. The Picts' name comes down to modern-day usage as the Pentland Firth and the Pentland Hills. This ethnic group occupied the north and east, their name stemming from the Romans' derisive term for those tribesmen who painted their faces and bodies and soon took in all those Gallic tribes who withstood Roman rule beyond Hadrian's Wall. They were a collective of peoples the Scots named 'Cruithni' (Q-Celtic from Pritani or Britons, some referring to their land as 'Pridain' and related to the Cwmry - the Welsh, reflected also in the name 'Cumbria'). According to Bede there were the northern Picts who dwelt beyond the Great Glen and the mountain ranges that split the land diagonally, and the southern/eastern Picts around Aberdeen, Perth and Edinburgh. Their cultural hub was at Scone (pron. 'Scoon'). The Scots themselves were Gaelic. 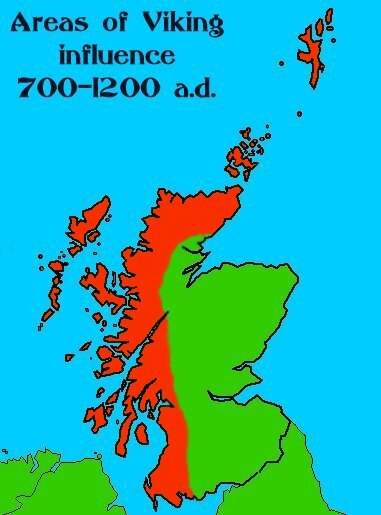 Having established themselves in Northern Ireland/Ulster by the 4th Century, they were 'banging on the doors' of Roman Britain from the north-west, spreading eastward from the Southern Hebrides to the territory we know now as Scotland. The Britons had settled the lowlands and were part of the Romano-Celtic theatre of cross-culture. some of the tribes were accepted into the 'foederati', the Roman equivalent of the Foreign Legion. Their chieftains chose Romanised names to aggrandise their pedigrees and their society adopted the aristocratic or authoritarian outlook of their paymasters. The typical homestead was of the large, round-house construction with outbuildings ranged around them and palisaded. In the east were the Votadini, allies of Rome and whose 'capital' may have been the large hill town on Traprain Law in Lothian. To their west was the kingdom once ruled by Coel Hen ('Old King Cole'). several of their princes claimed to be of his blood-line, the rulers of Rheged amongst them including possibly Dunragit in Galloway. This territory ranged southward beyond Carlisle - once the link with northern Wales by way of Lunedale, Merseyside and the Wirral. They claimed descent from the Roman Maximus, who took his legions to Rome in AD 383 to strengthen his claim to the imperial title. North from them was the kingdom of Dumbarton or Strathclyde, ruled at the time of Saint Patrick by the Coroticus or Ceredig denounced as a slave trader by the saint. The main threat to these Celtic kingdoms until the late 8th Century was from the Anglian kingdoms of Bernicia and Deira, from where a war-band first seized Bamburgh in Bernicia and then surged further northward onto the hapless Votadini. After AD 600 a truce was called between the two Anglian kingdoms and the 'whole' became Northanhymbra (Northumbria, the kingdom north of the Humber). In over-extending its resources the kingdom was racked by quarrels between the two houses and finally a rift between them lessened the threat to the Picts when the Bernician king Aethelfrith over-ran Deira. He was in turn overthrown in AD 617. Eadwin of Deira established himself shortly afterward as overall ruler and Aethelfrith's sons Oswald and Oswy took shelter amongst the Picts. Eadwin's Northumbria stretched up along the east coast as far as the Firth of Forth to Edinburgh (Pictish: Dinas Eidin, Gaelic: Dunedin). Wars erupted between the Christian king Oswald of Northumbria and the pagan Penda of Mercia and once more pressure on the Picts eased until another Northumbrian push brought them in Oswald's time under threat again as far as Dunbar. Later Oswy's son Ecgfrith was killed in battle at Nechtanesmere (Dunnichen in Angus) in AD 685. The Angles turned their eyes next on Strathclyde and by AD 721 there was an Anglian bishop at Whithorn. Soon further expansion brought the Northumbrians into Kyle and Dumbarton, their success made easier by inter-marriage and bringing Anglian royal blood to the Pictish line. The later downturn of Northumbria's fortunes was not solely due to the Celts withstanding their advance, but by Danish Norse attacks on Deira which cut off Bernicia from their Anglian neighbours by the AD 800's. 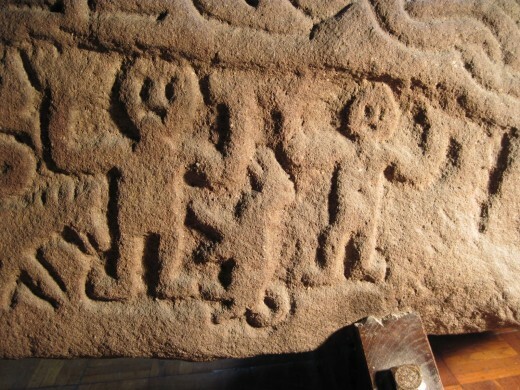 A Scoto-Pictish dual monarchy drove the Angles back from Lothian by the mid-10th Century. The last Pictish king of Strathclyde, Owen 'the Bald' won a battle at Carham with the help of Maelcolm II and the border with Bernicia was pushed back to the Tweed. The Pictish kingdom in the north-west around Inverness was unified with their southern - Scots -neighbours under Norse threat in AD 843. Anglian thrusts into the north abated under pressure from a different colonising Scandinavian direction. 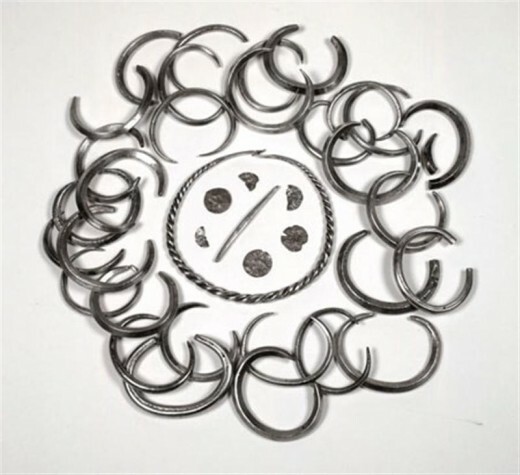 The 'Black Outsiders' ('Gentiles', according to the Pictish chroniclers) were understood to be the Danes on account of the prevalent black war-gear they chose to wear. The 'White Gentiles' were the West Norse - or Norweyans, as described in 'Macbeth'. 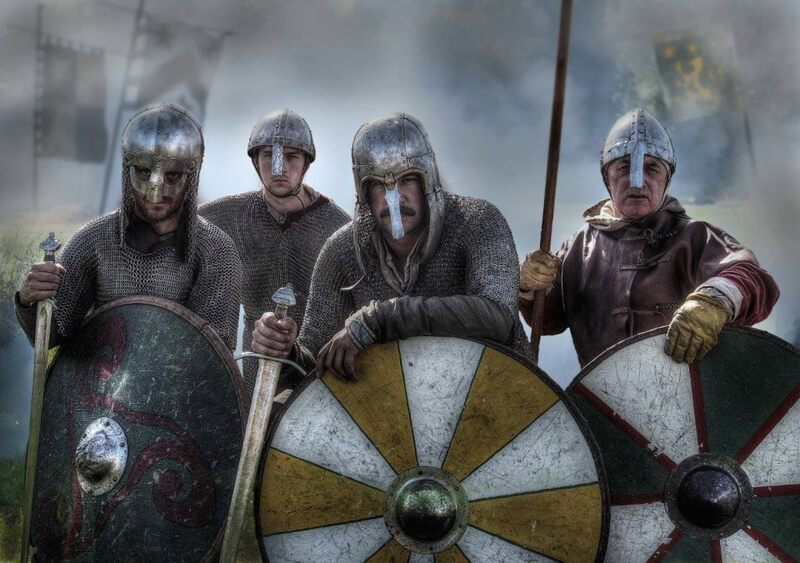 Danes based in eastern Ireland raided Dumbarton in AD 870. In AD 877 it was also the Danes who savaged Pictland and slew King Constantine II. However the 'Norweyans' were the greater threat in the region. They came in three waves. Initially between AD 780-850 farmers who had quit the barren uplands of western Norway settled in Caithness (Katanes), Shetland and Orkney. They would have had little opposition in a poorly populated region. Soon afterward came freebooters - pirates - opportunists who raided wherever easy booty could be found, that was either poorly defended or undefended, such as Iona in AD 795. The monks were either unwilling or unable to defend their monasteries. Next came the time of settlement under West Norse jarls who left their homeland because of the 'grasping, centralising and Christianising Harald 'Harfagri' (pron. Harfairi, meaning 'Fair-Hair).who lived from AD 863-933. In the Hebrides Ketil 'Flat-nose' became king, whose daughter Aud 'the Deep-minded' left to migrate to Iceland. To the south the raiders inter-married with the Wild Galloway golk to raise a generation of 'Gall-gaels' and a strong kingship flourished on Man. The dynasty established by Godfred 'Crovan' in AD 1075 lasted to AD 1265. In Orkney an even stronger Norse power emerged. Sigurd 'the Mighty' took his authority across the waters into Moray but died shortly after an epic fight with Maelbrigte 'Tooth'. 'Peat' Einar became jarl, ruling from AD 891-894 . His dynasty endured to AD 1231. A daughter took the blood-line to the Scots Earl of Angus. 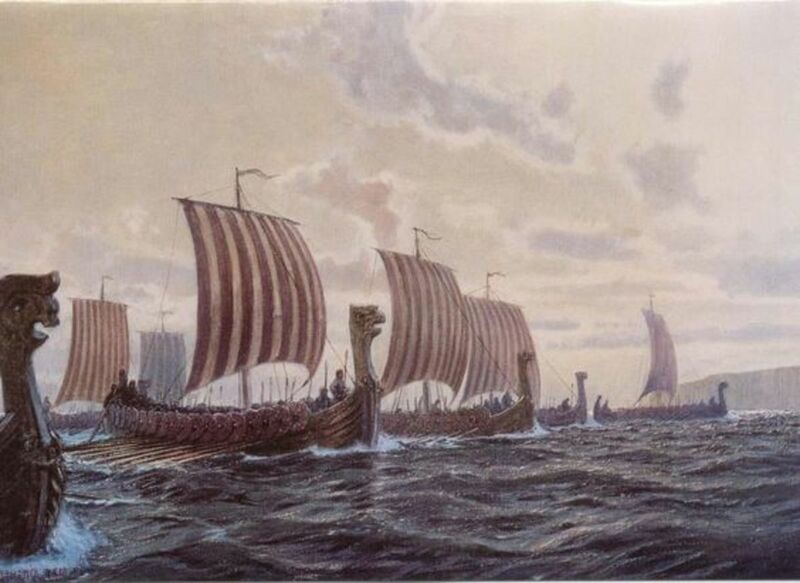 Orkney was a pivotal point in the West Norse sea empire. 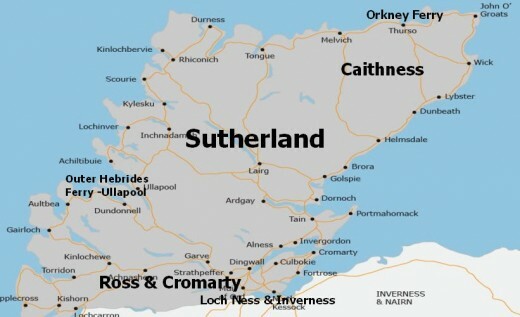 Her jarls held sway from their hall on Birsay not only over Orkney but also over Caithness and Sutherland (Sudrland) on the far north of the Scottish mainland. Scots kings were eager for their friendship. 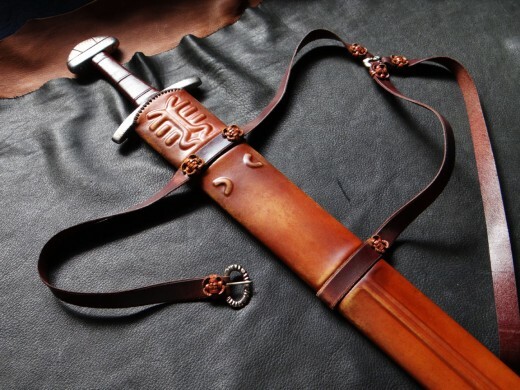 A daughter was given by Maelcolm II to Sigurd 'the Stout', who was killed at Clontarf near Dublin on Good Friday, AD 1014 fighting Brian Boru's Irish alliance on behalf of the Danes' king of Dublin Sigtrygg. 'Silkeskegg' (Silkbeard). Their son Thorfinn 'the Mighty' held Orkney, Shetland and the Hebrides from the Scots' king and also held authority over seven Scots earldoms. He was almost on equal terms with Macbeothen (Macbeth) and after his death around AD 1065 his widow (some said daughter) married Maelcolm III 'Canmore' (Big-head), Macbeothen's rival for the throne of Scotland. 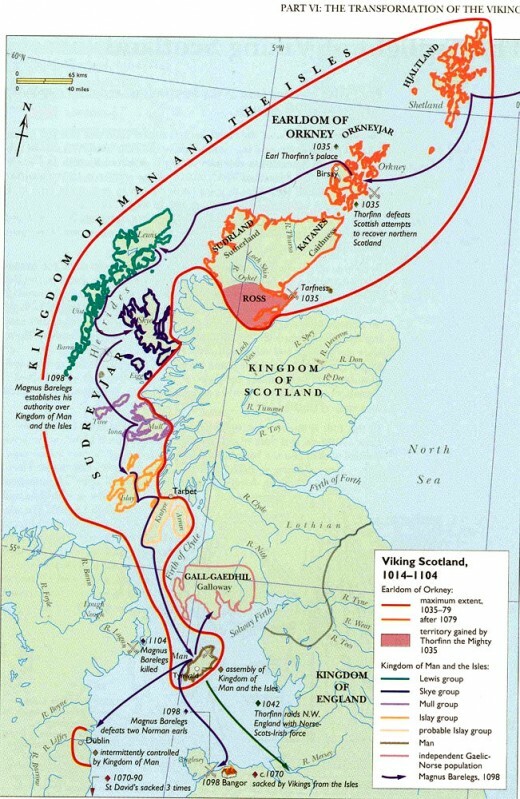 Any Norse threat to Scotland was minimal, however. 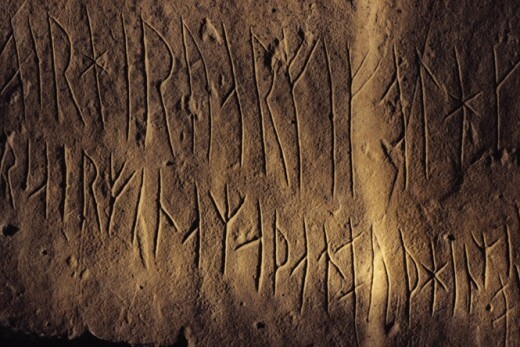 The Jarls of Orkney and King of Man did not always follow the West Norse kings' lead. 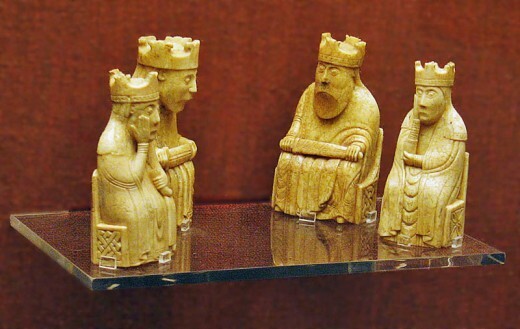 Dynastic struggles frequently split the rule of the Norse kings and Orkney jarls because of lax marriage customs. Some kings or jarls had more than one wife - one being a queen, the other a concubine or common-law wife - and their male offspring often challenged one another over inheritance. 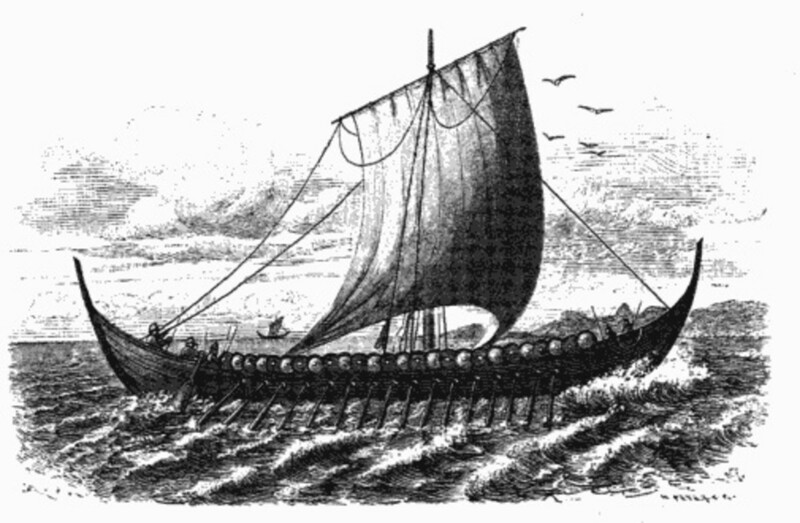 Also, Norse power was reliant on services due from Orkney reckoned in terms of ships and oars. The ships were not large, nor could they carry enough supplies for long campaigns - nor could they put out to sea in winter. Serious warfare was therefore impossible for the Norse kings and Orkney's jarls. Or more recently published by archaeologist and historian Neil Oliver as a companion to his TV programme series. Takes you from the pre-Roman era, through settlement by the Norsemen in the north of Scotland and isles to acquisition by Scots kings of Norwegian holdings in the 15th Century as a default on a princesses' dowry. Scotland. for such the kingdom had become, came more under the influence of the Anglian kingdoms than its peoples would care to admit. After the Danish takeover of Deira - the land bounded by the Tees in the north, the Humber in the south and by the Irish Sea in the west - Bernicia became isolated. Bernicia, being half the size of Deira, its Anglian ealdormen could not hope to put pressure of any kind on any of its neighbours, north, west or south. Certainly not south! Constantine III, who ruled from AD 900-943,took advantage of the situation and pushed southward - not to occupy but to build an alliance. From AD 913-915 he pushed as far south as Corbridge (east of Hexham on the North Tyne) to help the ealdorman against the Dublin Danes. He was unsuccessful in his mission and not long into his campaign came across the forces of Eadward 'the Elder', who had surged northward through the Danelaw in their own bid to oust the Danes from Northumbria. The Saxon Chronicle tells us that in AD 921 Eadward, son of Aelfred 'the Great', was in Bakewell where he took the oaths of the assembled kings of the Scots and Strathclyde Britons as their overlord, their 'Bretwalda'. Again in AD 927 the all-conquering Aethelstan took their fealty at Eamont near Penrith in Cumbria. . He effectively brought together the Scots, Britons, Bernician Angles with the Wessex Saxons against the Danes of York. When not long afterward the York Danes had been defeated, Constantine saw he had a foe more dangerous than the Danes or Northumbrians. IN AD 934 Aethelstan took on the Britons on the East Coast north of the Forth, reaching Fordun in the Mearns. Desperate, Constantine allied himself with his old enemies the Deiran and Dublin Danes as well as the Strathclyde.Britons. The outcome was as much a disaster for Constantine as it was for his allies at the celebrated Brunanburh, as lauded in the Saxon Chronicle of AD 937. The location of Brunanburh has never been settled. Some say near disaster happened near the Wirral, J D Mackie in his book "A History of Scotland" puts it in the Solway Firth area (around 100 miles/189 kms), including the loss of Constantine's own son. From then on the Scots courted Wessex, winning favour particularly in the light of another Dublin Dane, Sigtrygg 'Silkbeard', taking the throne of York. In AD 945 Eadmund savaged Cumbria, newly colonised by Irish-based Danes, and handed it to King Maelcolm I (AD 943-54) provided he became his ally on sea and land. Eadmund's aim was to block the route from Ireland to Northumbria - self-interest really, witness the abundance of Scandinavian place-names between the Lake District and the northern Dales - and the mighty Eadmund (AD 959-75) took up his mission with renewed energy. He was also dangerous to the Scots' cause insofar as he had the kings of the Scots (Kenneth II), the Cumbrians and a half-dozen other kings including Danes and Welsh row him along the Dee near Chester in a festival to honour Saint John 'the Baptist'. The Scots' threat to the fledgling kingdom of England was obviated by renewed Danish success in the strong Eadgar's kingdom, even as he died. 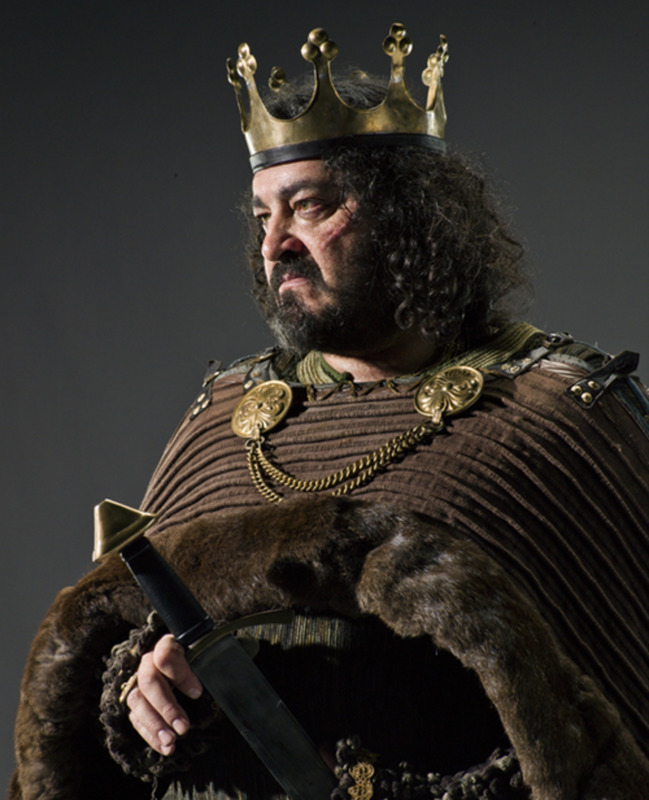 Aethelred was now head of a kingdom weakened by his own indecision. Following victory at Carham Maelcolm pushed his boundary south to the Tweed and practically annexed Strathclyde, whose king died in battle. By the fifteenth year of Knut's reign in AD 1031 the borders of Maelcolm's kingdom were virtually as they are now His kingship also took on more of the feudal nature of the English kingdom to the south. The old Celtic ways had been abandoned by way of the passing of their ancient rites. True, Scone remained its centre, but the only other vestige of the Scots' heritage was its system of rule by alternate members of the same aristocracy - one drawing its power from Atholl, the other from Moray. Malcolm II had no son and in nominating as his successor Duncan, son of Abbot Crinan of Dunkeld he began a civil war. Following his plan he had murdered the grandson of his predecessor Kenneth III. 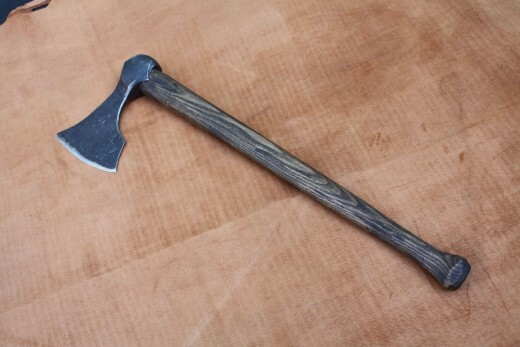 The murdered man had a daughter/grand-daughter Gruoch, mother of a son Lulach. By her second marriage she became queen to Duncan's chief rival Macbeothen/Macbeth, son of a Mormaer of Moray and himself royal-borne. Duncan was not the snowy-bearded old man murdered in his bed in Shakespeare's play, but a headstrong young fellow, who had prejudiced his position by losing at Durham in AD 1039 and was slain running from battle by Macbeothen. Cumbria was lost to Siward 'the Dane', King Eadward's earl of Northumbria and brother-in-law to Duncan. Macbeothen was next faced with Maelcolm, the offspring/nephew of Duncan in alliance with Siward at Dunsinnan in AD 1054. Macbeothen slew Siward's older son Osbeorn in battle and escaped to rule Moray in the north of Scotland, but was slain in turn by Maelcolm in AD1057 at Lumphanan in Aberdeenshire. His stepson Lulach reigned for four months but was slain by Maelcolm, nicknamed 'Canmore' (Big-Head) at Strathbogie. Maelcolm therefore ruled over the whole of Scotland as Maelcolm III. However, it still has to be acknowledged that it was only by the help of his southern neighbours that Maelcolm achieved Duncan's dream of a united Scots' kingdom. There were still the Danes in Ireland, who saw a prize in wresting Maelcolm's kingdom from him. And there were the Norsemen in Orkney, Shetland, Lewis, Caithness and Sutherland. From AD 1098 the West Norse king Magnus 'Barelegs' made inroads on the Scots' infant kingdom and forced Eadgar, Maelcolm Canmore's son by Margarethe/Margaret, to yield the western isles and to afford sheltered waterways for the Norsemen's ships between the isles and down to Man. 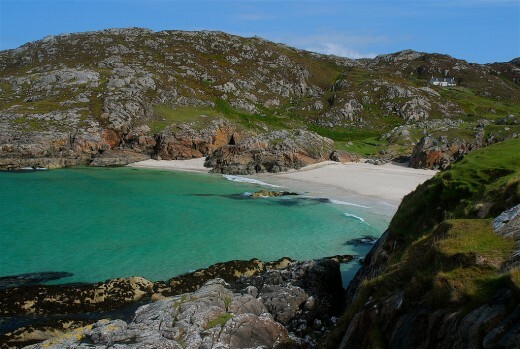 By having his longship dragged across the narrows of Tarbert on Kintyre he laid claim to that part of the mainland. Magnus' authority was re-established over Orkney, the Hebrides and Man. Luckily for the Scots he was killed foraging for food on northern Irish soil. [Magnus 'Barelegs' earned his name in insisting on wearing a kilt in the Gaelic manner, as opposed to leggings as other Norsemen did].. His death did not rid the Scots of the Norse threat. Some of the Hebridean chieftains allied themselves with the men of Moray and the Manxmen tended to find common cause with Galloway. In AD 1153 one well-known Hiberno-Norse leader Summerlid/Somerled aided one of the pretenders to the Scots' throne, Donald McHeth. Donald was part Gael, who quarrelled with the King of Man, was killed near Renfrew eleven years later. Harald Matadsson had ruled Orkney for along time and wielded considerable power. He allowed an invasion fleet to use Orkney as a jumping-off point against King Sverre (AD 1192-4) and although he forfeited a large share of his revenue he kept the earldom. At the very end of the century King William 'the Lion' of Scotland made use of Harald's Norse neighbours in attempting to oust him but Harald was not that easy a target and retained his earldom. One enterprising Norseman took the castle at Rothesay in AD 1230/1, but he 'lost his footing' with the Scots' building further castles around him and edging him out again. A marriage between Harald, the king of Man and Cecilia the daughter of King Haakon of Norway would have threatened the Scots, but in returning to Man his ship foundered. Alexander III tried in vain to buy the islands, and then allowed his men to raid Skye in AD 1262. Haakon made a bid to restore West Norse fortunes around the north of Scotland. In AD1263 he had one of the greatest fleets assembled that ever left his kingdom, had the earl of Orkney provide ships and pilots to negotiate the waters and brought in the Manx king on his mission. The fleet numbered around two hundred ships, and fifteen thousand men were recruited. Nevertheless the venture was poorly organised. On mustering at Kerrera some of the island chieftains refused to join him, pledged as they were to the Scots' king. The fleet rounded Kintyre, raided Bute and forty ships were dispatched to Loch Long. They were dragged overland to Loch Lomond to plunder the land around. Alexander sent a field army, but in the mean time the Norse fleet was hammered by a storm in the Firth of Clyde and on landing a few hundred men to salvage some of the stranded ships they were beaten back. The Battle of Largs was by no means a major engagement, but it was too much for Haakon to endure. He put his storm-damaged ships about for Kerrera, then on for Kirkwall where he sent all but twenty of his fleet home. Haakon died at Kirkwall, listening to Bible-readings and the sagas of Norse kings (of which he was the last) that Snorri Sturlusson assembled for his great work, the Heimskringla. Magnus Haakonson tried for peace but by AD 1265 control of the isles - including Man - had been wrested from the Orkney jarls by the Scots. 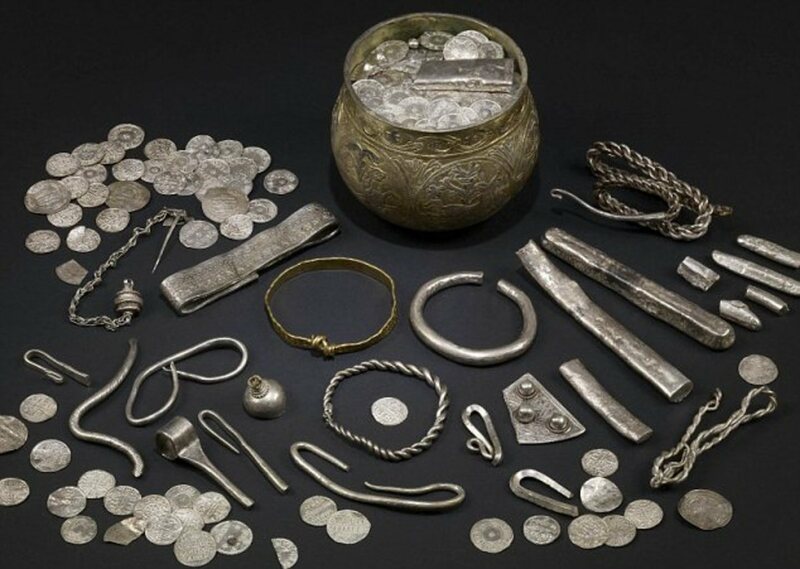 In AD 1266 the Treaty of Perth decreed that Norway yield all the possessions but Orkney and Shetland for a cash payment of 40,000 marks and a 'perpetual annual' of 100 marks (not such as bad deal for Norway!) In AD 1281 Eirik II, Magnusson, wedded Margaret the daughter of Alexander III, (who died giving birth to their daughter Margaret, later known as 'the Maid of Norway). After Margaret's death Eirik married Isabella, the sister of Robert de Bruis/de Brus ('the Bruce'). The Norsemen and their families in the northern territories were given the option of leaving with their possessions. Archaeological digs at Freswick in Caithness suggest the ones who stayed maintained their earlier lifestyle. Even now the citizens of Thurso deny any links with the 'clans'. Norse input into Scottish history has been considerable, with the absorption of those of Norse ancestry into the Scottish 'entity' peacefully established. The last Norse elements to be absorbed into the fabric of the Scottish state in AD 1589 were Orkney and Shetland, part of the dowry of James VI's queen Anne of Denmark (to which the Norwegian islands had passed in the interim). I have a common, easy-to-spell real name, so I liked this for being neither. And nobody was going to let me name a daughter that, so I had to use it somehow. I knew it was old English, but didn't know the meaning. Thank you! Do please keep going. I think this series is going to get used as a school assignment for a relative, who is of Scandinavian and English ancestry. Ta again for the compliment. When I've finished this one Wales comes next, but there's not so much Viking history in Wales - you'll find out in due course. Meanwhile, I've got Scotland to finish. Another excellent hub. Content and research is amazing. Thanks again for the excellent presentation.